Steel and PVC aspiration cannula complete with aspiration control handle. Aspiration control hole has a diameter of 1,5 mm., allowing the surgeon a slower aspiration response. Whenever the hole is opened the aspiration on the tip will slowly decrease. Even with a very high aspiration pressure the cannula makes only a low amount of noise. Complete line and specials can be easily produced following your indications. Strong enough to use as a probe. Sterilised by gamma radiation. Single sterile blister packaging. Angle and rotate to 90° in relation to the handle to facilitate a lateral hold. Atraumatic silicone tip, made of “Medical Grade” silicone Shore 60. Particularly adapt for Neuro Surgery, ENT, Maxillo facial, dental surgeries and in general, Micro surgery. Cannulae are made of Medical PVC polyvinylchloride. 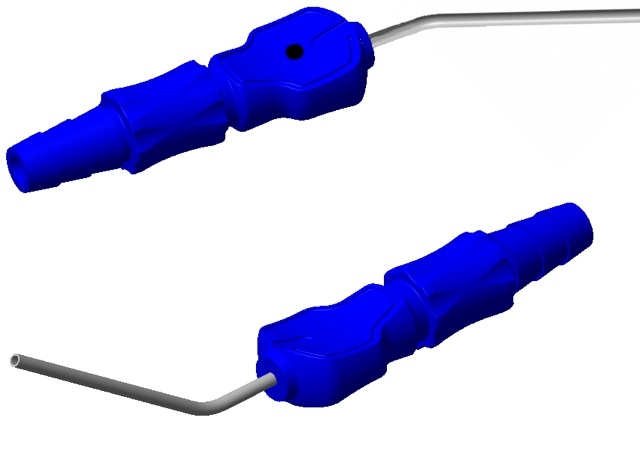 Aspiration control handle made of copolymer styrene-butadiene (ABS). Particularly recommended for DIRECT SUSPENSION MICROLARYNGOSCOPY. Suction control handle made of copolymer styrenebutadiene (ABS). Sterilised by gamma radiation. Single sterile packaging. See also our Kits for Middle Ear Surgery and Micro Cannula for Neurosurgery. To see our complete line of suction tubes for different surgical applications, click here.